I thought I’d share a bit of a craft haul and about the supplies I’m enjoying at the moment. First you probably can’t see but I have some great little stickers to use thanks to Jenclair. She made these with a xyron machine and they are awesome. I’ve been using them in my planner and one of my journals. Another fun addition to my rubber stamp collection was this one from Two Lips. You probably can’t see the text in green but it says: “The overwhelming feeling of joy when you manage to sneak another bag of craft supplies you don’t need into your house.” Makes me laugh every time I read that. My husband got a kick of that one too. He said he’s given up trying to figure out what some of my crafting tools and supplies are for. The paper you see on the bottom is a paper kit I found at Tuesday Morning and it’s the Fabulous Life Collection kit from Authentique. I love the retro vibes and it even has a sheet of stickers. You can find it on Amazon but if you have a Tuesday Morning near you go there because I bought mine for $7. Other items I’m into right now are digital kits from Etsy. There are so many cool designs you can find. I have a new color printer so having quick access to these is great. So far I’ve incorporated some into the junk journals I’m working on. If you need any recommendations or you use some let me know. Speaking of Etsy, it’s their 13th anniversary! 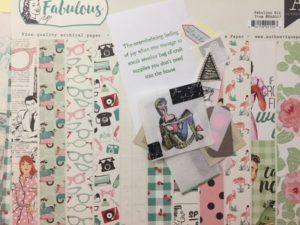 I’ve had my shop for about 8 years and while I sometimes get frustrated with their changes (some more coming in July), I still like to shop there to support other crafters and artists and I like having a presence there. Anyway, since it’s the anniversary a lot of shops are having sales for the entire week so it’s a good time to visit and buy gifts or treat yourself. I’m also running a sale on my shop! Tell me if you’ve been into any crafts lately. I love to hear what people enjoy creating. Everyone should go to your shop and ‘shop’! I love your Nancy Drew journals! 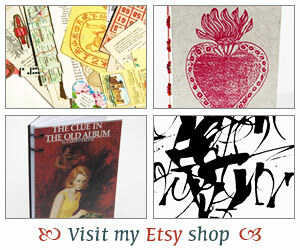 I have found some great items on Etsy, including in your store. 🙂 You are so talented! 🙂 Craft supplies are “inventory,” and I love a large inventory! Two Lips stamps are so funny, thanks for the link! Congrats on 13 years on Etsy! I’ve been using more digital downloads in my journal too. They’re nice, and easy to print out on sticker paper and then cut out to use. I am knitting a bit. Yay for craft hauls, I love going to the craft store. I like the stamp, enjoy the goodies!